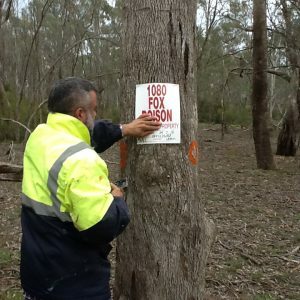 A six month works program targeting pest and weed management in the Ramsar listed Koondrook-Perricoota Forest has been supported by Murray Local Land Services through funding from the National Landcare Programme. 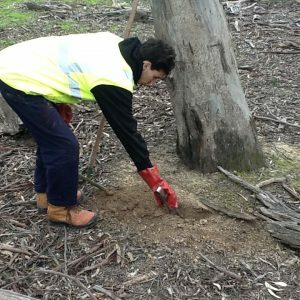 The Moama Local Aboriginal Land Council and Forestry Corporation NSW have worked together to develop a works program targeting specific weeds and pests within these ecologically and culturally significant forests. 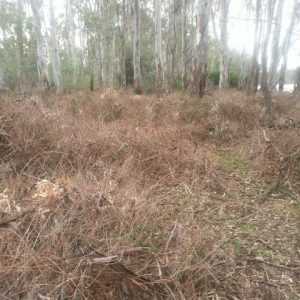 Under the guidance of Forestry Corporation staff, the Land Council team has undertaken fox baiting (targeting known turtle nesting areas), rabbit warren fumigation on sand hills and weed control works targeting blackberry, African Boxthorn and Horehound. 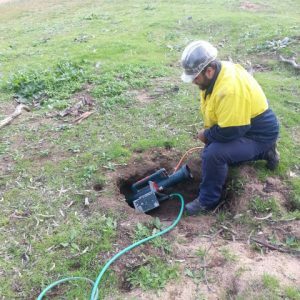 Shaun Kerr busy fumigating rabbit warrens. Photo – Phil Hudson. The work program began in May this year and will run through to the end of spring. When will Perricoota forest be opened for camping?